Internet giant Google has partnered with London venue the Barbican to prove that coding is beautiful, with an immersive series of digital art installations. Launching at a private viewing on Monday (7 July), the Google-sponsored DevArt showcase is part of the art gallery’s Digital Revolution exhibition. Artworks were commissioned especially for the exhibition. 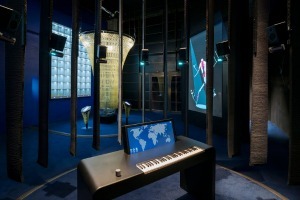 Visitors can experience Karsten Schmidt’s Co(de) Factory, an online tool that can be used to create 3D sculptures, Zach Lieberman’s Play the World, which scans hundreds of radio stations to find musical notes, and Varvara Guljajeva and Mar Canet’s Wishing Wall – a visual piece which transforms whispers into virtual butterflies. Les Métamorphoses de Mr Kalia by undiscovered French artists Cyril Diagne and Beatrice Lartigue was chosen by a panel of judges to be displayed alongside the works of professionals. The installation turns visitors’ body movements into an animated character. Alongside the exhibition, Google has announced a new art DevArt Young Creators programme, a set of coding workshops geared at students aged between nine and 13 years old. Steve Vranakis, executive creative director of Google Creative Labs, said at the launch event: "The whole idea was to show how coding can be a creative inspiration. It’s been going on now for a while, we just wanted to acknowledge it – code is a creative discipline." The exhibition will run until 15 September, and is also available to view and interact with online.